30/4/12 - Acquisition - Strasbourg, Musée de l’Oeuvre Notre-Dame - Two Gothic stained-glass windows were pre-empted by the Musée de l’Oeuvre Notre-Dame at the Sotheby’s auction in Paris on 20 April. Each was estimated at 50,000 to 70,000€ : Judas’ Kiss (ill. 1) sold for 156,750€ and The Crucifixion (ill. 2) for 228,750€. 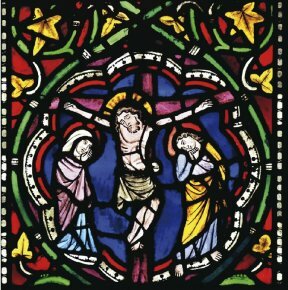 The stained-glass windows in the Dominican church of Strasbourg, consecrated in 1260, have experienced an eventful history. They were moved and added to when the church was replaced by a larger building in 1308. Then, before a section was transformed into a library (later destroyed by bombings in 1870), they were taken down and purchased in 1832 by the Fondation de l’Oeuvre Notre-Dame to be reinstalled in the cathedral, notably in the Saint-Laurent chapel in 1856 where they are still visible. 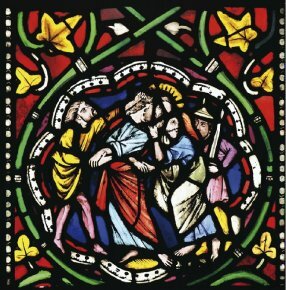 Françoise Gatouillat  attempted to trace their history and reconstitute the original stained-glass ensemble, distinguishing the scenes from the life of Christ , framed by episodes from the Old Testament, some on a greeen and yellow background, the others on red and blue . However, seven medallions, a fragment of a hagiographic scene and the two Sotheby’s stained-glass windows remained in the studio of Albert Sigel, a glass-mirror specialist in Strasbourg, awaiting a restoration which never took place ; eventually forgotten, Sigel’s grandson sold them in 1909 to the Wernert family, without a specific authorization . In 1948 and 1957, the medallions and the fragment finally joined (purchase and donation) the collections of the Musée de l’Oeuvre Notre-Dame. We might ask ourselves why the heir of the master glassmaker was able to sell them and if the museum might not have claimed them at the time. Cécile Dupeux told us that the question had come up but that these two stained-glass windows did not appear to be part of the large ensemble of 292 panels acquired by the Fondation de l’Oeuvre Notre-Dame and reproduced at the time in watercolors and drawings by Félix Fries, chief architect for the city between 1843 and 1854. Besides the support of the French Ministry of Culture which, through the Fonds du Patrimoine, contributed the exceptional amount of 50,000€ to the city of Strasbourg, the donation pledges received from various associations and many private individuals are also significant : the Amis des Arts et des Musées de Strasbourg, the Société des Amis de la Cathédrale, as well as the company TRYBA Industries have each promised 50,000€ ; the Dominican congregation and several other donors have contributed 17,190€. The acquisiton of these two works will round out an important ensemble for Strasbourg ; as well as being historically valuable, and despite a few restorations, the two stained-glass windows are of high quality. Françoise Gatouillat, "La verrière typologique de la première église des Dominicains de Strasbourg", in Gals. Malerei. Forschung. Internationale Studien zu Ehren von Rüdiger Becksmann, Berlin, 2004, p. 101-107. We would like to thank Barbara Gatineau and Joëlle Pijaudier-Cabot for pointing out this article and providing certain details concerning the pre-emption of the two stained-glass windows. Many reside today in the Saint-Laurent chapel. The whereabouts of The Nativity and The Adoration of the Magi are not known. Many are held at the Musée de l’Oeuvre Notre-Dame, while Abraham’s Sacrifice is now part of the Burrell Collection in Glasgow, and The Martyrdom of Jeremy resides at the Württembergisches Landesmuseum in Stuttgart. In her article, Françoise Gatouillat writes : "after over sixty years, the grandson of the person who had stored them felt free to cede these forgotten objects."